As you drive north on Old 101, you go through many very beautiful and luxurious towns, but then there's a sudden change. 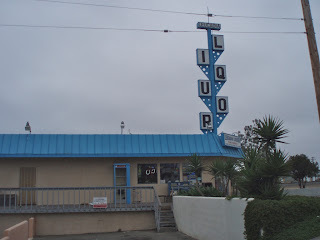 Just into Leucadia, there's a stretch of what I think of as the old 101. There's a trailer court, a store called "Lou's Records," little surfing stores -- all in old stucco one-story buildings, with very 1960s sort of retro signage. 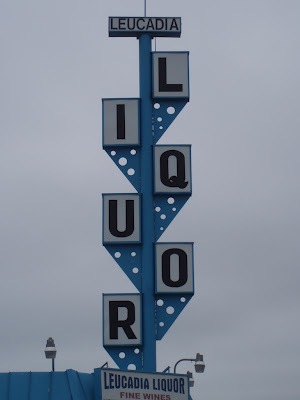 This liquor store sign is my favorite. I stepped inside and it wasn't nice at all, by the way.